Obviously you’ve got too much hacking to do right now, but that game of Tetris isn’t going to play itself. 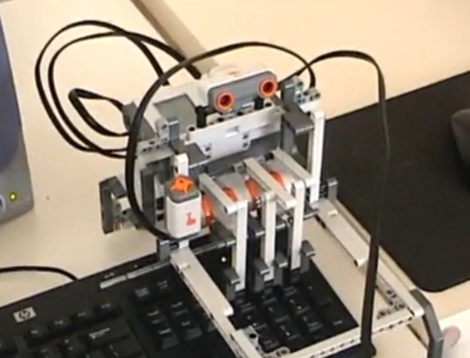 [Branislav Kisacanin] has you covered with his Tetris-playing robot which is build with LEGO Mindstorm pieces. The setup is actually pretty complicated. A Texas Instruments DM6437 video development board watches the computer screen via a webcam and calculates the next move. It then outputs that to a grid of LEDs which the Mindstorm watches using a light sensor. See it in action after the break and then take some time to check out our other various Tetris based hacks. The video was kind of a let down, as cool as this is, I’d rather see more of the robot moving, than a silent tetris screen for the first 45 minutes. A strange game. The only winning move is not to play. How about a nice game of chess? LOL! Nice hack. I’d like to see how it holds up with higher speeds. I’ve loved you guys for years and quite frankly I look forward to checking your site throughout the day for some great hacks, but lately I’ve been getting really tired of a quick blurb and a link to YouTube and then following it up with links to past hacks without any real content. Turn it into a story, give a link to the creators website or documentation, and if there isn’t any available, then link to some of the hardware they used or do 10 minutes of research and add some content. Get back to your Hack-A-Day roots guys… come on. @constructive criticism While I don’t necessarily mind short posts, I have to agree with you that more in-depth ones are better. This is a much bigger issue for me than the percentage of posts which contain arduinos. Go long posts! Also, did anyone else think of the Nintendo R.O.B. when they saw this? I agree with the above. This is incredibly cool and I admire the creator for his ingenuity and creativity. I’d love to read more and get the details of the algorithm and how fast it can play. I would like some more depth as well, but that’s just because i want more excuses to linger here on HAD.